How is the EU governed? The US government is established and limited in power by the US Constitution. However there is no EU Constitution that I can find, and there are quite a few political analysts (pundits), appearing on various talk shows in the wake of the Brexit vote. They variously make claims that the EU is being run by a small council of bureaucrats that are not elected and not accountable to anyone other than the political elite in Europe that arraigned their appointments. And that the elected parliament has no real power, and their votes are non binding and meaningless. I find this more likely to be opportunistic rabble rousing but my personal research has not led me to any concrete answers that would provide me with anything concrete to believe. So how is the EU governed? What documents spell out its rights and responsibilities? One of the main criticism of these treaties is that they are very hard to understand for lay people and they are in fact much more detailed than most constitutions (and certainly much more detailed than older constitutions like the US constitution). Interestingly, there was an attempt at turning all this into a “constitution” of sorts through the “Treaty establishing a constitution for Europe” (a mouthful and a source of endless theoretical debates about what this would have been: a constitution? a treaty? both? something else?) This was voted down by French and Dutch voters in two referenda and shelved… until most of its contents reappeared in the Lisbon treaty and became EU law, only without the “constitution” moniker. If you follow discussions about the EU, you might have heard about many other treaties like the Maastricht treaty, the Nice treaty or the Lisbon treaty. Those were treaties amending the main treaties. Among these, the original Treaty of Rome (1959) and the Maastricht treaty (1992) were the most important ones but unless you have an interest in the history of the EU you don't need to read them directly. EU institutions and member states work based on the consolidated versions integrating all these changes. Accession treaties include many technical dispositions to deal with overseas territories, earlier obligations and other special cases. Changes of a territory's status also sometimes require a treaty, for example the Convention on the association of the Netherlands Antilles with the European Economic Community or the Greenland treaty. Some rather important stuff like the statutes of the European Central Bank and of the European Court of Justice is found in protocols attached to the TEU and TFEU. Side agreements and special treaties loosely connected with the EU like the Euratom treaty (includes all EU/EEA members and Switzerland but legally separate) and the Prüm Convention (includes only some Schengen member states). The Schengen area is an interesting case. It started as a separate set of treaties, the Schengen Agreement (a mere declaration of intention) and the Convention implementing it (which is the text that contains all the actual rules governing the Schengen area). Later on, it was (mostly) integrated into EU law, in the form of two EU regulations (the Schengen Borders Code and the Schengen Visa code). Despite being part of EU law it does not apply to the UK and Ireland (which have an opt-out) or to Romania, Bulgaria, Croatia, and Cyprus (which are in principle bound to join it but haven't so far). There are also special agreements allowing Iceland, Norway and Switzerland to join the Schengen area. In the EU context, the treaties I just described are called "primary law". They define the structure and workings of the core institutions and these institutions are bound by them. The rest of EU law (the actual rules fleshing out the principles laid down in the treaties and regulating many things in the EU) are termed "secondary law" and defined in various instruments called directives, regulations, etc. The treaties also contain a legislative procedure of sorts, specifying how secondary law is enacted and are in this respect very similar to a constitution. The Commission is the largest institution. It has an important role in preparing EU law (see below) but also manages EU programs (structural funds, funding for scientific research, etc.) and monitors and enforces existing EU law (infringement proceedings). The Commission has to be approved by the Parliament and, since recently, there is an informal agreement that its president must be the leader of the winning group of political parties in the last European Parliament elections but its members are named by the member states (one per country). Another little-known but quite important part of the Council is the COREPER (committee of permanent representatives or COmité des REprésentants PERmanents in French). The COREPER includes one representative per member state and is the place where new rules and changes to secondary law are discussed and negotiated, ahead of actual council meetings. The Parliament also has to approve most (but not all) changes to secondary law. It is elected directly by citizens in each EU country during the same week (because the exact modalities of the election differ from one country to the next and countries traditionally vote on a different day of the week). 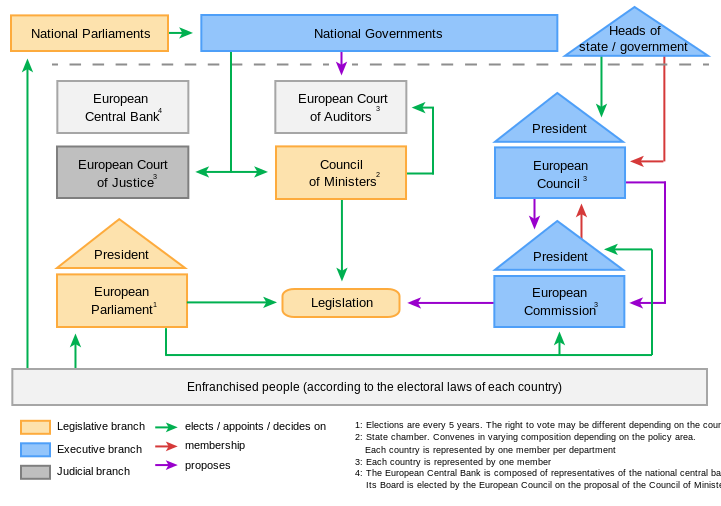 It gradually took on a larger role in the legislative process, in an attempt to make the EU more “democratic” but still works very differently than a national parliament. The European Council (it's not the same thing as the Council of the European Union; when EU insiders speak about “the Council”, they usually mean the latter) groups all EU head of states or government. It sets the general direction, drives any revision of the treaties and frequently steps in in times of crisis (it meets at least 4-5 times a year). The European Court of Justice has an important role in infringement proceedings and in guiding national courts in their implementation of EU law. It also regularly hears cases brought by one EU institution against another one regarding their respective responsibilities and which procedure is applicable. The European Central Bank obviously has an important role when it comes to the common currency but Eurozone governance would warrant a separate Q&A in itself. There are several procedures to revise the treaties but without getting into too much detail, it should be noted that this process is firmly in the hands of the member states. 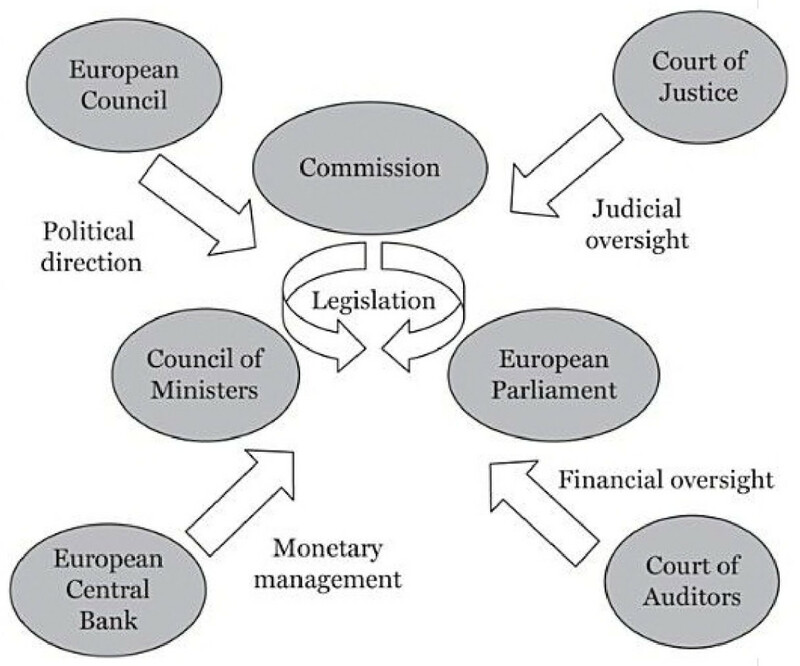 The process is driven by the European Council (the meeting for all heads of state or government) and often requires an intergovernmental conference. Any revision also requires the consent of each and every member state and, in most cases, ratification following national rules (typically this means at least a vote in parliament but it might also require a revision of the constitution and/or a referendum). That's one of the reasons why revisions have become increasingly uncommon (the last major overhauling of the treaties is the Lisbon treaty, which is itself based on the Treaty establishing a constitution for Europe and was therefore negotiated and prepared before the big 2004 enlargement). There are several procedures to enact secondary law. 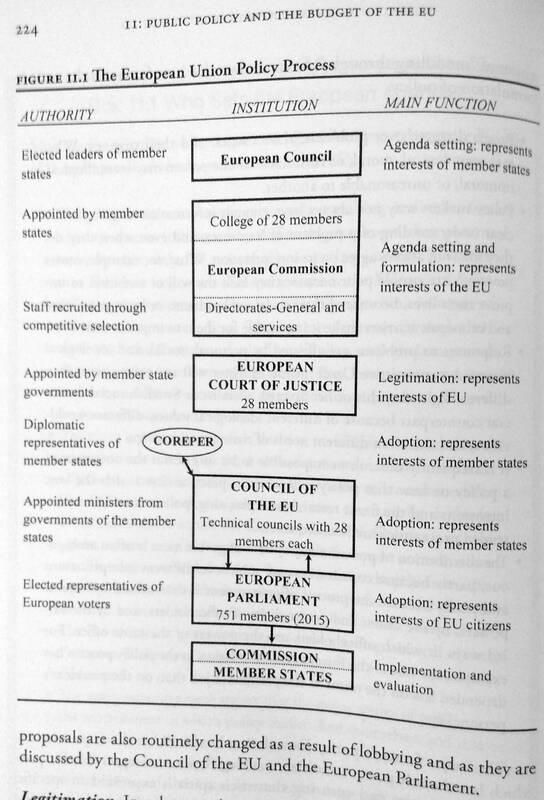 The “main legislative procedure” (formerly called codecision) involves the parliament and EU council. EU law can be invoked in front of national courts in each EU country, under certain conditions (regulations definitely can, directives generally cannot but there are exceptions). The documents which are the main constitutional basis for the EU are the treaties of the European Union. Of those organs, the one which manages the day-to-day affairs of the EU is the EU commission. It is the closest thing the EU has to a government. The EU commission makes proposals for new EU legislations (EU regulations, directives and decisions). But any of these need to be accepted by the parliament, so their votes are definitely binding and meaningful. In many cases the council of ministers also needs to accept legislative proposals. The difference between a regulation and a directive is that an EU directive itself has no actual effect yet, because they still needs to be implemented by the member-states in form of national laws which need to pass the national legislative processes. There were cases where it turned out that EU directives could not be implemented in certain states either because the implementing laws couldn't pass legislative process or because the implementing laws violated the national constitution. A good example is the EU data retention directive (which was then also repealed by the EU court of justice). The European Union: Politics and Policies (2017 6 edn). p 224. Not the answer you're looking for? Browse other questions tagged european-union or ask your own question. How many votes were cast in the 2014 EU elections? How was European Medicines Agency's new location actually decided? Are Japan's Prime Minister visits in Eastern Europe and Economic Partnership Agreement related to US withdrawal from Trans-Pacific Partnership? How does the EU allocate food quotas to individual countries/producers? Who decides how EU structural funds are distributed? How is the number of representatives within EU structures computed?